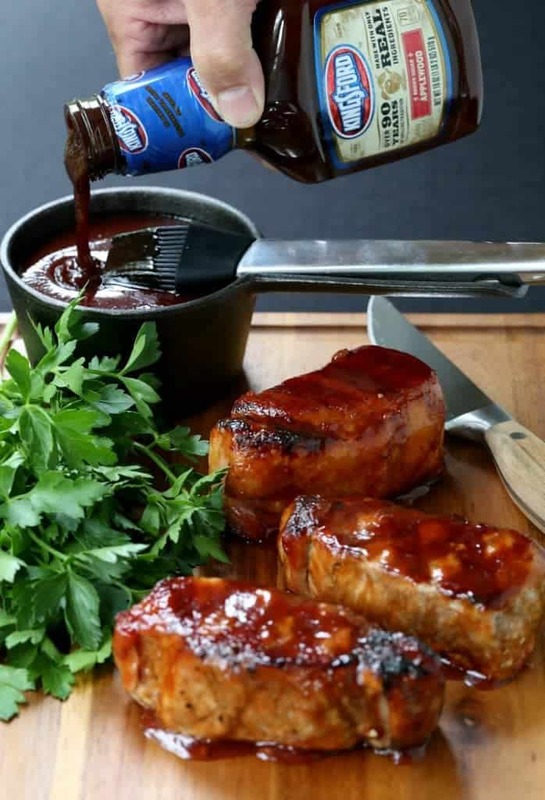 Cider Brined Pork Chops with Brown Sugar BBQ Sauce are hitting the grill for dinner tonight! 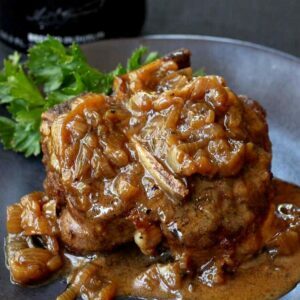 This pork chop recipe is sure to be a hit with everyone! Looking for more grilling favorites? 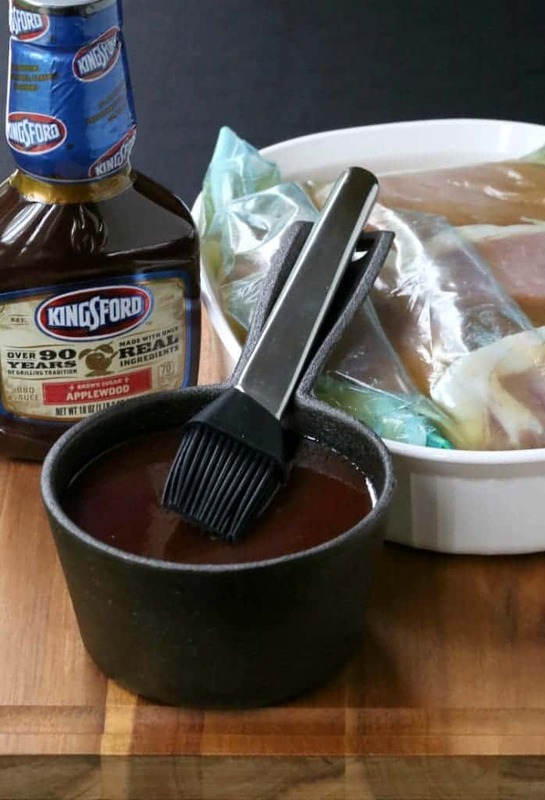 We love using Our Favorite Steak Marinade on steak, obviously, but also chicken and pork! What do I love about summer? Lots of things…warm weather, staying outside as much as possible, sipping an ice cold beer on the deck after yard work or hanging with some friends…but food. It’s all about the food since there’s grilling to be done. Lots and lots of grilling. 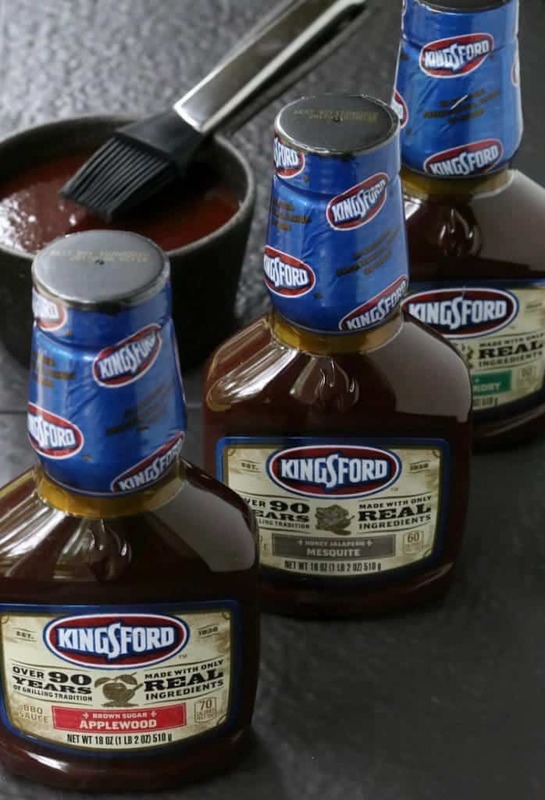 So when I found Kingsford®’s new line of sauces and rub for meats, I knew I was going to be hitting a home run for dinner. For these pork chops I grabbed the Brown Sugar Applewood BBQ Sauce, but there’s other flavors too like Honey Jalapeño Mesquite and Original Smoked Hickory. I thought for these pork chops a nice apple flavored brine would go perfectly with the Brown Sugar BBQ sauce and man, I was right. Why do you use a brine to mane this pork chop recipe? A simple brine will add tons of flavor to pork and also helps to lock in the juices so your meat doesn’t dry out. 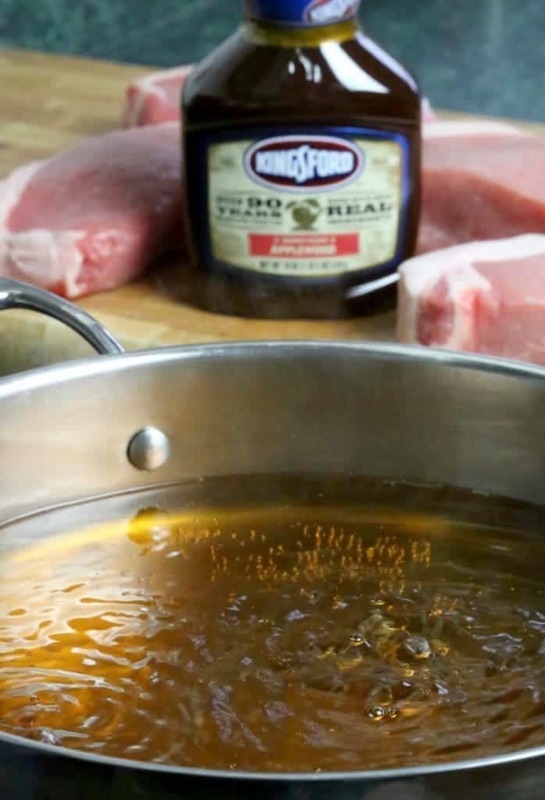 To make the pork chop brine, start by adding apple cider, apple cider vinegar, brown sugar and salt to a pot. Bring that mixture to a boil and let it simmer for a few minutes, then take off the heat to cool. Once the brine is completely cooled, pour it into a resealable bag along with four pork chops. Seal it up then get it in the fridge for at least a few hours. Remove the pork chops from the brine and pat dry with some paper towels. You want to get a good sear when you put these chops on the grill and that won’t happen if they’re still wet with the brine. Now that the pork chops are ready, it is time to get the grill ready. 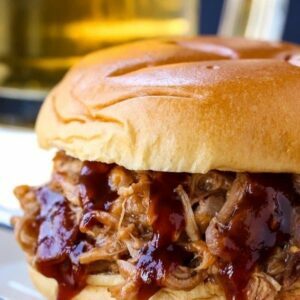 What Is The Right Pork Temperature? The thickness of your pork chops will depend on how long you need to cook them. For a pork chop that’s about 1 inch thick, you’ll need to grill them for about 5 minutes on each side. Use a thermometer and check to make sure the internal temperature is 145 degrees and you’re all set. If your pork chops are thicker like mine, add a few more minutes on each side and keep checking the temperature so you don’t overcook them. Because there’s nothing worse than overcooked pork chops! 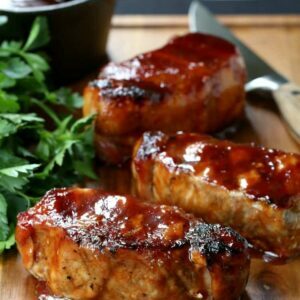 During the last minute or so of grilling you can start to baste the pork chops with some of the BBQ Sauce. Don’t add the BBQ sauce when you first put the pork chop on the grill because it will burn. 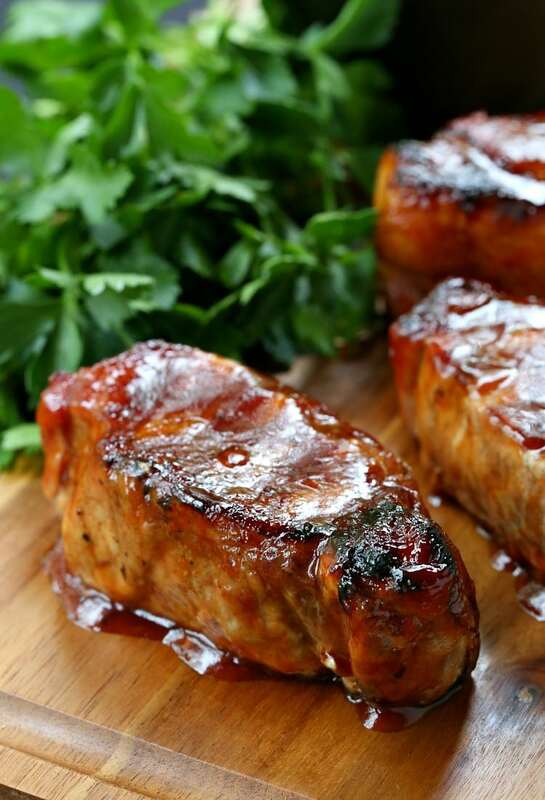 Remove the pork chops from the grill to a platter and let them rest for 5 minutes before serving. Letting the pork rest also helps lock in the juices from the meat so don’t skip this step! 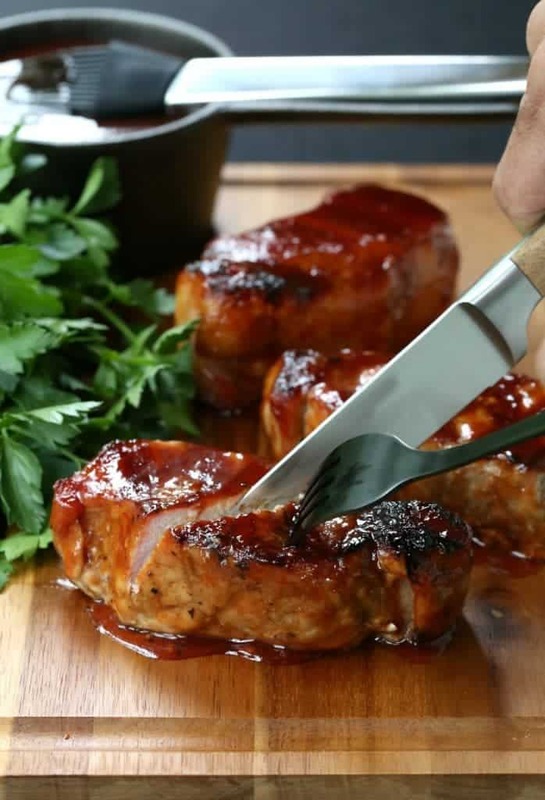 We like to heat up extra BBQ sauce and serve it on the side of this pork chop recipe. Because the more sauce, the better am I right? Even if you think you aren’t a grill master (which I certainly am not) you should really try this easy pork chop recipe. 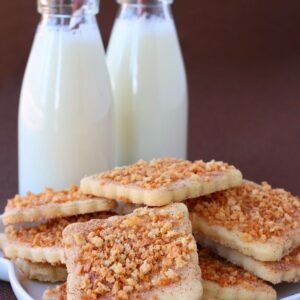 It has become one of our favorite grilling recipes! This easy pork chop recipe comes out perfectly juicy every time! No dried out pork chops here! In a large saucepan combine apple cider, kosher salt, brown sugar and apple cider vinegar together and bring to a boil over medium heat. Cook the brine for 3-4 minutes, stirring frequently until salt and brown sugar are completely dissolved. Remove the brine mixture from the heat, pour into a bowl and add 2 cups of ice. Allow the mixture to cool completely then pour into a large re-sealable bag. Add the pork chops to the brine and seal the bag, removing as much air as possible. Preheat the grill to 400 degrees over medium heat. Remove pork chops from the brine and pat dry with paper towels. Place the pork chops on the grill and cook approximately 4-5 minutes per side until they reach an internal temperature of 145 degrees Fahrenheit. 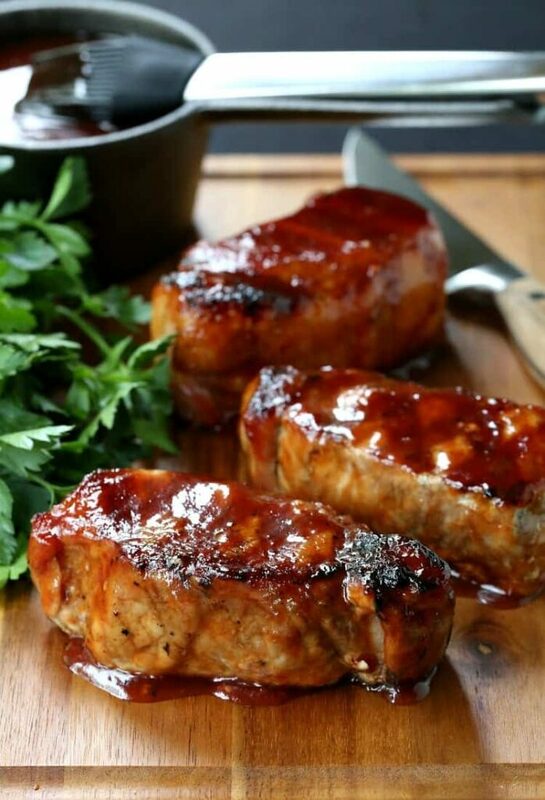 During the last minute of grilling, baste each side of the pork chops with the BBQ sauce. Remove the pork chops from the grill and allow to rest for 3-5 minutes before serving. Serve with extra warmed BBQ sauce. Nutrition information is without the brine, since most of the brine will be discarded.